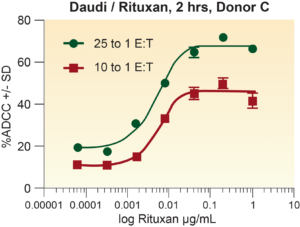 Figure (Left): 5000 Daudi cells/ well were incubated with serially diluted Rituxan antibody for 15 minutes prior to the addition of purified NK cells maintained overnight with IL-2. The ADCC reaction was further incubated for 2 hours at the specified E:T ratios (25:1 Black and 10:1 Red). % cytotoxicity was measured using the aCellaTOX assay. 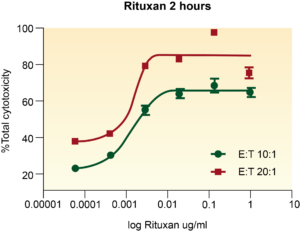 Determination of optimal E:T ratios for the Target Cell line. Procurement of the Antibody (or Antibodies) and Target Cell line (s) to be tested. 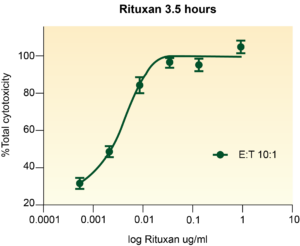 A dose response curve would be generated using aCella-TOX or FACS analysis or both. (as requested). Target Cell line(s) (adherent or suspension) (frozen vial(s)) and sufficient Antibody for the project. Number of PBMC donors to be tested. Information on Antigen expression Level on the target cell line (s) (FACS analysis can be done at the request of the client to determine this). 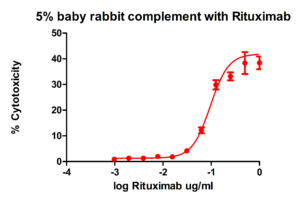 Final Report would be turned in after the Project with a dose response curve, showing Antibody dependence. Typical time frame is approximately 4 weeks / Cell line / Antibody. For Schedule and Pricing, please call 888-727-7297 or 650-960-2170, or email us at sales@celltechnology.com.